It is with great regret that we have decided Sticky can't stay. Ron's allergies are just too bad to live with. I've only had Sticky a week, but I'm amazingly attached to her and am very sad. In an effort to aid in her next and hopefully forever adoption, I am going to detail my time with her and what a lovely little dog she is. If you are in the San Diego vicinity and are even remotely thinking of adopting a small dog (14lbs), take Sticky- She's is one in a million! Here is Sticky, mid blink, taking a rest in the grass. Sticky is about 3 years old, and was picked up as a stray in LA county. She was nearly starving and given a euthanasia date. The Barking Lot (http://www.thebarkinglot.net/) saved her from being euthanized and took her to their San Diego shelter to fatten her up, and get her spayed and healthy again. I saw her goofy picture on Craigslist and said "I think I love that dog." 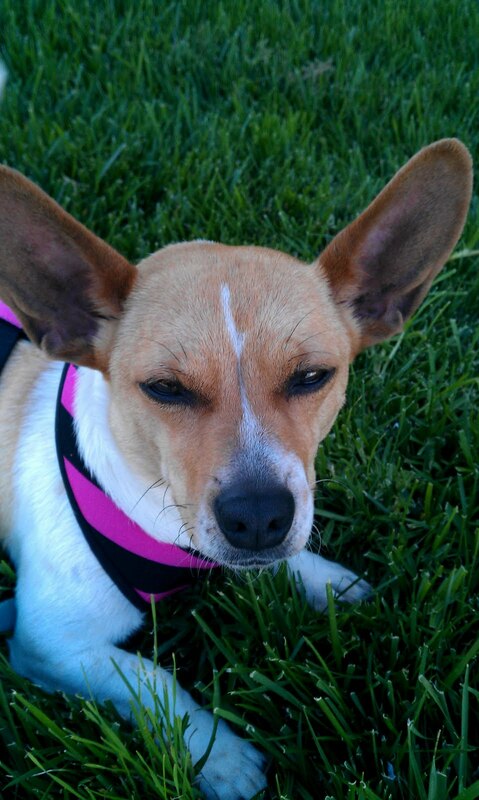 She is a Corgi/Chihuahua mix. I went and meet Sticky and knew I wanted to take her home. When I was leaving she got a bit upset because she didn't want to go back into the shelter, which I can understand. She is pretty chill and it is really chaotic in the shelter. Loose dogs, barking, running around, etc. A very nice volunteer from the Barking Lot came to our apartment last Saturday. They always do a home check before adopting dogs out and after that, Sticky was mine. She was a bit timid that day. Not so much with me, but with Ron the environment in general. The next morning though, she was completely different and totally chill. Sitting on our laps, wanting a tummy rub! Sticky completely house trained and is also crate trained. She treats her crate like her own little apartment. She knew the crate I had was for her from the get go, and happily goes in for a nap, or when I put her in. She is also leash trained and walks really well. I got her a harness, instead of a collar, because her neck is bigger than her head and her collar would come off. She is good in the car, and likes to go for a walk, but not too far. I took her about 2 miles and she was way too tired by the end. I felt so bad when I realized she was wiped out, that I carried her the rest of the way. She took herself to bed that night at 7pm. Poor thing! Sticky LOVES food. She is really easy to motivate or train, because she will do anything for a treat! Yet, she doesn't seem to beg for food. She likes chewing on a bone and really likes gobbling down pigs ears. Sticky listens really well when you tell her "NO." She chased Kitty once and Kitty was totally traumatized, so in order to give Kitty her own space, I have been blocking off the bedroom door with Sticky's crate. Ron and I were watching tv in the bedroom and Kitty was on the bed with us. Sticky could see all of us and decided to climb the crate and come on in. And why wouldn't she? I got up, put her back on the other side and said "NO." She never tried it again and now just lays down if we are in the bedroom. She doesn't whine or scratch or anything. She is a really good dog. One last plug for Sticky- she's the happiest dog I've ever known. She will stand or lay down in a place where she can see me, and just happily wag her tail. Completely content looking at me. So sweet! I really really wish I could keep Sticky. When I adopt and animal, I consider myself responsible for them for the duration of their lives, and this is incredibly hard for me. The thought of taking her back to or leaving her in the crazy shelter breaks my heart. That being said, she will have to be adopted again through the Barking Lot, which will hopefully happen lickitey split. Ok, I am going to go back to moping and being sad. Thanks for reading about my sweet little friend.